The Soyuz spacecraft carrying the Expedition 56/57 crew lifts off from Baikonur Cosmodrome in Kazakhstan on June 6. At the far right is Canadian astronaut David Saint-Jacques. In the past few days, I watched three brave people discuss their space work in front of a corps of hungry journalists, gracefully walk in spacesuits through the blazing Kazakhstan heat and strap into a spacecraft for the ride of their lives. Many Space.com readers have been to launches at Kennedy Space Center (KSC) in Florida, which I was fortunate enough to do three times between 2009 and 2010. Several members of the press corps around me asked what it was like being at Baikonur instead of KSC. Many of the launch preparation activities are the same, I explained, but because the press corps can get a little closer here, you feel like you are more of a part of the spacecraft's journey. Since the end of the U.S. space shuttle program in 2011, the United States has been using Soyuz spacecraft for all of its crewed rides to space. But this situation won't last much longer: Around 2019 or 2020, NASA plans to switch to commercial crew spacecraft and send most astronauts aloft from American soil, for the first time since 2011. 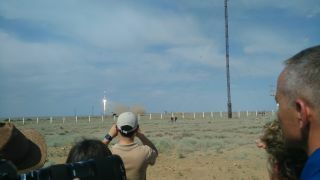 Prior to launch, the Soyuz rocket carrying the spacecraft was put on a railway track and sent to the launchpad on June 4, passing extremely close to journalists. Hence the selfie. At the Baikonur Museum near the cosmodrome, our guide spoke in Russian, and an interpreter translated into English. I tried to ask some simple questions in Russian, to practice. A few hours later, the interpreter complimented me on my Russian; I think she was being too kind, but I thanked her. She then asked if I would have some time to visit some local students; she teaches English to several people, including some working at the cosmodrome. Though I work as a journalist, I firmly believe a part of my role is to educate. So I immediately agreed to go. I managed to hire a taxi driver in Russian, point to the address I needed and arrive at an apartment building. At the reception desk, I explained myself in broken Russian. The woman pointed up the stairs, and I found the group on the second floor. There were two bankers, a mathematics teacher and two space program employees. Four other foreigners, also in town for the launch, and I spent 90 minutes speaking with the group. These 20-somethings were an inspiration: On top of working full-time and demanding jobs, they are learning English because they recognize language skills are important. I left the meeting feeling a lot of hope. This was the future of Baikonur, sitting in the room in front of me, and these ambitious people were already thinking about how to work in the future. So, who knows — some Space.com readers may end up meeting these people as local guides someday. Several journalists (including Elizabeth Howell) jokingly took turns standing in the Soyuz commander's spot on this tarmac. Here, astronauts make their final statement to Russian space officials before heading to the launchpad. For most of my time, I traveled with 42 other journalists and space program officials, as well as local interpreters, drivers and helpers. The food at our hotel in Baikonur was basic, we spent most of our time on buses lacking good air conditioning or suspension, and the lack of Russian-speaking skills among most of us made asking for help an interesting process. So we banded together quickly. Outside of these organized tours, it is possible — but very difficult — to get access to Baikonur yourself as long as you arrange for the right visas. I did meet somebody at the hotel who told me he came here via that route, on his own. I suggest only Russian speakers pursue that method, however, as you will need to do things like read paperwork and negotiate with customs officials on the road. Baikonur is accessible by train and plane, and most of its residents are bilingual in Russian and local Kazakh dialects; English is never a guarantee. I spoke to Remco Timmermans, a Dutch communications professional and space fan, to get some advice on how space enthusiasts can get to Baikonur to watch a launch. He has attended three launches and is planning on a fourth in December; he will lead a tour group there. "The trip will likely start with the rocket rollout, and end a day after the launch, so about six days in total," Timmermans told Space.com by email. "Usually we meet in [the Kazakhstan towns of] Astana or Almaty and we travel to Baikonur from there as a group. We will arrange all travel, all trips to city and cosmodrome sites, plus hotel and of course the permits for all launch-related activities (rocket rollout, rocket arrival at the pad, press conference, hotel walkout [on the way to suit-up] , spacesuit walkout and launch viewing from site 18)." Timmermans warned that Westerners will need to be careful of a few things. Most tourists stay in Central Hotel or Student Hotel, where the food is basic and dates back to the 1960s. Only Central Hotel offers a breakfast, which is edible but wouldn't impress "foodies". The city is open, but make sure not to leave its gates by yourself, as you may not be allowed to return without the tour guide. So, how was my experience? I have several gigabytes of space memories taken on my cellphone, and many more lodged in my head. I had the privilege of watching talented space journalists from around the world come to tell the story of Expedition 56/57. I even got to know some people working in Baikonur, which was unexpected, considering I was here for only three days (mostly spent sitting on buses). The whole experience hasn't sunk in yet, but I feel an incredible sense of privilege — and I hope more people can see what I've seen. Space is just too cool for a few people to keep it to themselves. Editor's note: Elizabeth Howell is a freelance space reporter covering the launch and docking of Expedition 56 for Space.com from Baikonur Cosmodrome and Moscow. You can read more about her epic Russian rocket launch road trip here.